Lipsi (also spelled Leipsoi) has a population of about 800 people, one town, and is only 5 miles (8kms) from one end to the other. For many people this would mean it's the ideal Greek island, with nothing much to do other than relax and enjoy the Greek way of life. It does get quite busy in the summer with visitors - relatively speaking, of course - but it's a lovely little island if you do want to get away from it all. Visiting in spring or autumn is best, if you're not fond of crowds and want a better chance to get to know Lipsi and its people. 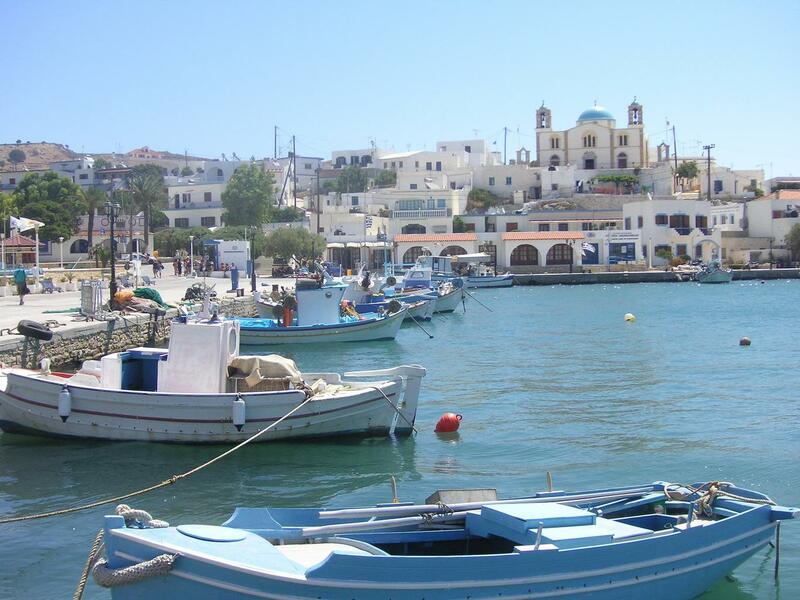 Lipsi is too small to have an airport and the nearest island with an airport is Leros. There are daily ferry connections from Leros to Lipsi. Leros is Lipsi's closest neighbour and there is one regular ferry per day with a journey time of 50 minutes, and a fast ferry taking just 20 minutes six times a week. There are also six ferries a week from Patmos, taking only 25 minutes. If coming from Athens then there is only one ferry per week and the journey time is 10 hours. Other options with daily ferry services are Kalymnos (90 mins), Kos (4.5 hours) and Rhodes (5.5 hours). Lipsi Town is a pretty place of attractive buildings which climbs up a hill from the port, with other hills all around. When you arrive by ferry you take one look and you feel glad you've come here. The port gets lively in the evenings, and the hardest thing you have to do is choose between the fish tavernas that line the promenade. Lipsi Town is also where you'll find the facilities, including a bank, ATM, post office, travel agencies, taxis, bike and scooter hire, supermarkets, a health centre and the police, who are based at the port. There's accommodation and some good eating places, with a sandy beach a few minutes' walk away. If you enjoy hiking there are plenty of beaches around the island, some less than a mile from Lipsi Town. Many of the island beaches are pebble beaches, so if you prefer sandy beaches then check before you commit yourself to a day there. There are good sandy beaches at Kambos, about 15 minutes west of Lipsi Town and which has some shade, and at Katsadia, about 20 minutes in the other direction. Don't expect much by way of facilities at any of these beaches, so if you're going for the day be sure to take food and plenty of water with you. Some do have tavernas which open up for the summer, but it's best to play safe. In summer a bus service goes between some of the beaches and Lipsi Town, or you can get boats to take you and pick you up again. A popular hike is to the church of Panagia tou Harou, which has great views and there's also a beach down below it. Other than that the main activities are hiking, swimming, sunbathing and generally hanging out and relaxing.